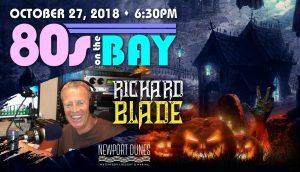 Newport Dunes Waterfront Resort is pleased to present 80s on the Bay: Fright Night on Saturday, October 27 from 6:30-10 p.m. Hosted by legendary ‘80s DJ, Richard Blade of Sirius XM and Jack FM, this ghoulishly delightful Halloween themed dance party inside the Big Tent is the perfect way to kick off Halloween weekend in a mystical waterfront setting. Dance the night away to spook-tacular ‘80s hits, enjoy the fang-tastic food trucks, and don’t forget to check out the spirits at the bar! Guests of all ages are invited to dress to impress for the Halloween costume contest for a chance to win thrilling prizes. Arrive early to enjoy dinner along the waterfront at Back Bay Bistro, just steps from the event. Return to Back Bay Bistro for the After Party where DJ Richard Blade will continue the ‘80s jams, take photos with fans and sign copies of his new book, World in My Eyes – An Autobiography. Saturday, October 27, 6:30-10 p.m.
*Parking is $10 per car. Standing room with no guaranteed seating. Seat upgrades may be available. No outside chairs will be allowed. Includes upfront tabling seating near the stage, waiter service for the bar, VIP restrooms and admission to the After Party at Back Bay Bistro. For additional information about 80s on the Bay: Fright Night, please visit https://bit.ly/2NAjFDx. To make a dinner reservation at Back Bay Bistro, please call 949-999-3100 or visit NewportDunes.com/Bistro. Newport Dunes Waterfront Resort is an iconic recreational area featuring a 450-slip marina, boat launch, private waveless beach and playground that has been enjoyed by families since 1958. It’s the summer home of So Cal’s largest inflatable waterpark. The Dunes’ signature restaurant, Back Bay Bistro, is a critically acclaimed dining destination open for lunch and dinner, featuring award-winning cuisine and stunning water views. Newport Dunes is also home to 24 charming cottages available to the public and a state-of-the-art RV park.